Airsprung Group PLC has joined the furniture industry’s leading research body. The Furniture Industry Research Association (FIRA) has unparalleled industry knowledge and is the only organisation that provides support for all market sectors and for the entire furniture supply chain. It is a unique, not-for-profit membership-based organisation, run by the furniture industry for the furniture industry. Over 140 years Airsprung Group PLC has grown to become one of the UK’s largest manufacturers and suppliers of beds and upholstery. The aim of the Group is to build brands that specialise in their target market sectors, from high street independent stores to digital-only retailers. The brands cover beds, (Airsprung Beds, Hush-a-Bye Beds, and Gainsborough Beds and Sofa Beds) and upholstery (Cavendish and Collins and Hayes). In addition Swanglen are a leading headboard and bedroom furniture manufacturer and all Group companies are supported by our in-house foam converter Airofreem. Tony Lisanti, CEO of Airsprung Group, said: “The issue of safety standards and best practice is rightly becoming increasingly more important for both retailers and consumers. Having always taken a lead in these areas we were keen for all of our Group companies to join the Furniture Industry Research Association. Membership offers both retailers and consumers the reassurance which FIRA’s position as a world leader brings to the products that we supply. It also gives the Group access to extremely useful information such as market intelligence and technical and innovation reports via FIRA’s website. 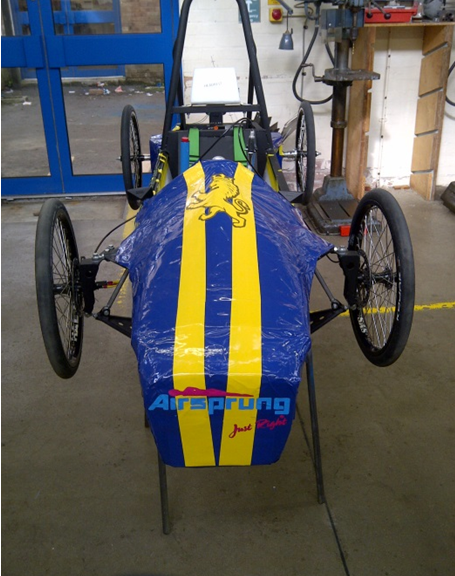 In late 2013 Airsprung Group were approached by The Clarendon Academy to sponsor their participation in a Green Power Initiative. This project, run by The Greenpower Education Trust aims to advance the understanding and education of sustainable energy and technology among young students. Clarendon AcademyClarendon Academy sponsorhipThe challenge saw students tasked with designing and building a battery powered vehicle capable of speeds up to 40mph. Once the vehicles are complete they will be raced at well-known race tracks throughout Britain. Airsprung are happy to be supporting this initiative in our local community. As sponsors, The Clarendon Academy have been keeping us informed of the progress of the design and build, and have supplied us with the attached images. We would like to wish all the students involved every success for the remainder of the challenge, and will post updates and results.